The winning class with 21.58% of students participating was 5th grade who has won a party at Rockin' Jump on June 2, 2017 from 1pm-3pm! 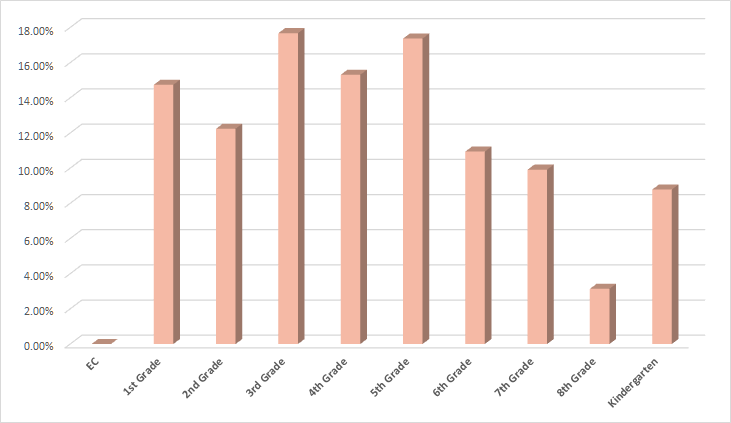 3rd grade took 2nd place with 21.55% participation - so close! The winning school with 21% of students participating was Half Day School, who has won a $1000 Physical Education grant. 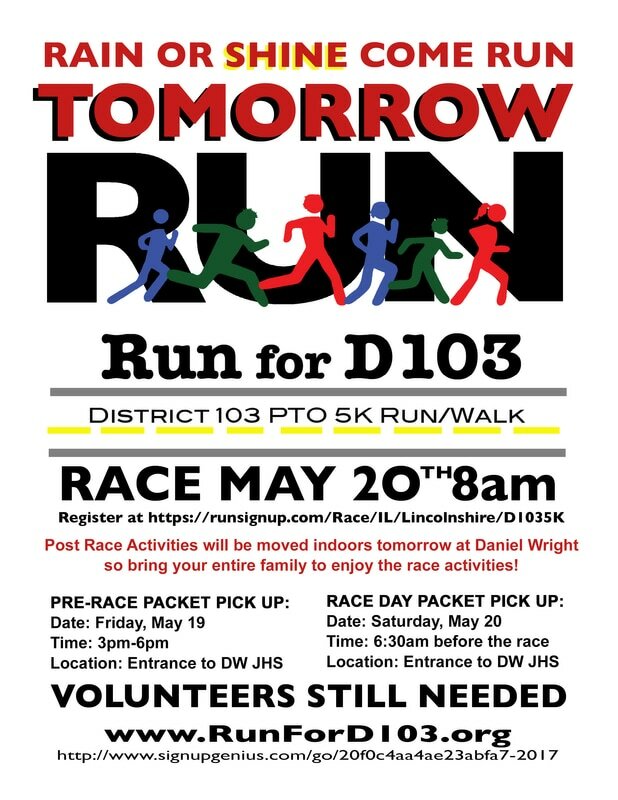 Pre-Race Day T-Shirt Pick Up will be available on May 18 from 9AM-11AM and 3PM-8PM at Daniel Wright Junior High School (See Driving Directions). Packet Pick Up will also be available on Race Day beginning at 6:30AM. Email our registration team members at D103RUN@yahoo.com. I am excited to present your company with a unique marketing and sponsorship opportunity that will reach over 1000 families in your direct target market! 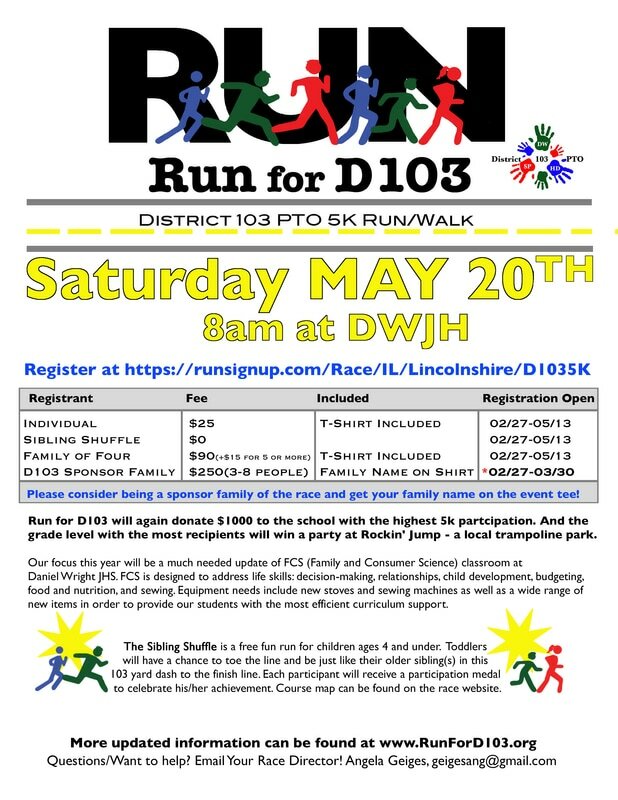 On Saturday, May 19, 2018, The Parent Teacher Organization (PTO) of Lincolnshire-Prairie View School District 103 is hosting its 8th annual Run for D103: PTO 5k Run/Walk. This community-school district event is a fundraiser to finance outdoor recreational needs in District 103! Over the past seven years, we have funded over $140,000 to our schools for their playgrounds, fields, fitness center, sound equipments and many other projects. The District 103 Annual 5k has been an unqualified success being a fun, family, community event with over 800 race registrants, and over 1,000 attendees. What a great feeling it was to watch our kids beaming with pride as they raced towards the finish line to complete their very first 5k! This annual event is becoming one our kids and families look forward to every year! Please join School District 103 PTO this year in our commitment to provide daily outdoor recreational activities for our children and consider one of the following sponsorship opportunities (see attached Proposal for Benefits of Sponsorship). 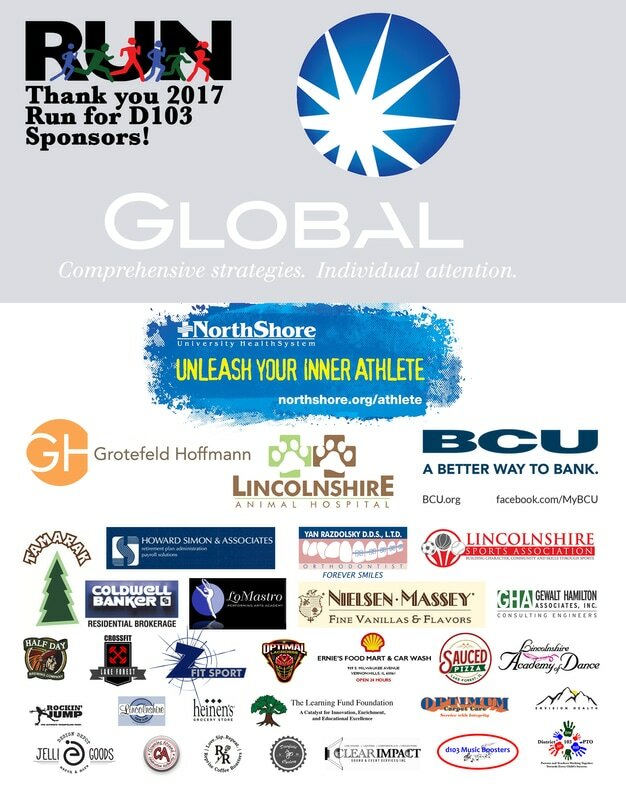 The deadline for sponsorship promotion on event materials and t-shirt giveaways is March 30, 2018. To confirm your participation, contact Angela Geiges at geigesang@gmail.com. Please make all checks payable to District 103 PTO. Please do not hesitate to call with any questions. Parking: Limited Parking will be available at Daniel Wright. Additional Parking will be available at the Village Church located at 201 N. Riverwoods Road-about 3 blocks South of DW on the east side of Riverwoods. We encourage carpools and biking to the race due to limited parking. Riverwoods Road Closure: Riverwoods Road and the streets on the race course will be closed from 8am-9am on Saturday, May 16, 2015. There will be no parking on the race course during this time. Please be cognizant of the "No Parking" signs erected by our local police department. 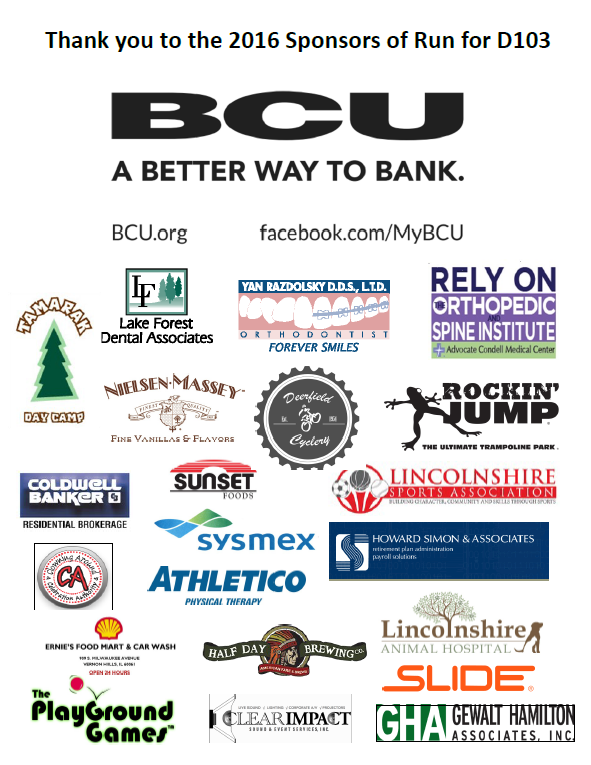 We can't do this without you! Come join us on the beautiful Saturday morning and enjoy the success of this family-friendly event with us! Interested in joining our fun and active team of volunteers? We are still looking for parents willing to help organize this wonderful event - this is a perfect opportunity even for working or stay-at-home parents! The top three male D103 students in the 5K were CAMRON MAHDAVIAN, JACK KLEBOSKY and JAKE SURANE. The top three female D103 students in the 5K were JENNA IMMELL, HOPE PLENDL and HAILEY KLEIN. ​Congratulations to all the participants. You should be very proud of yourselves! WINNING SCHOOL: HALF DAY SCHOOL, with 19.7% of students participating, has won a $1000 Physical Education grant. The day could not have happened without the incredible, tireless efforts of a team of volunteers - Race Directors KATHERINE ROBBINS and TODD JENSEN and a whole slew of parent volunteers who pitched in many hours for many months -Thank you to all for helping to make the 5th Annual District 103 5k a success. "No Parking" signs erected by our local police department. ​Questions? Please contact Katherine Robbins at katherine.m.robbins@gmail.com.